The cloth is an Indian patchwork made from worn-out saris. This pie was inspired by a delicious dessert my husband and I ate on a trip to Waterville, Maine. For the last several hours of the journey, we drove through a nor’easter—I didn’t know nor’easters occurred in the summer, but they do. By the time we reached our hotel, it was after nine o’clock and we were cold, tired, and starving. When we asked about local restaurants, a woman at the desk referred us to the Freedom Café. We showed up so late that the only people in the place were the owner and the staff, chatting as they tidied up from that evening’s meal. But the owner, a beautiful African-American woman, greeted us warmly. In fact the whole place was warm, decorated in bright and rich colors that made us forget how chilly we were. “I don’t know if there’s much left,” she said, “but I can try to make up plates for you.” Indeed she did—we had barbecued ribs, bowls of gumbo, rice, macaroni and cheese, vegetables, and salad. When it came time for dessert, we were so stuffed we at first turned down her offer of pie. “Oh, but it’s part of the dinner,” she said. “Well, in that case, we’ll share a piece,” we said. So out came a divine pecan pie with chocolate as the secret ingredient. I’ve tried to recreate it here. Freedom Pecan-Chocolate Chip Pie is a one-crust pie just like last month’s Big Mama Thornton Apple Pie, so I’m recycling the instructions for the crust—including advice about grocery-store crusts if you don’t want to make your own. I’ve discovered that increasing the ingredients slightly makes it easier to roll out a nice piece of dough that fits the pan with no thin spots around the edges. Sift the dry ingredients together, then cut the shortening in using two knives scissors style. The shortening shouldn’t be completely blended or the crust will be tough. You want bits of shortening, no larger than lentils, to remain because they melt as the crust bakes and make the crust flaky. Next, sprinkle the water over the flour, salt, shortening mixture and use a fork to toss and blend. Use more water if necessary, but only a little bit at a time. The dough should be moist enough to adhere together in a ball, but not sticky. Form the dough into a flat patty, using plenty of flour on your hands, then roll it out. Use plenty of flour on your rolling surface and rolling pin too. Turn the dough frequently as you roll it out, and sprinkle it with more flour, so it doesn’t stick to the rolling surface. When you’ve shaped it roughly into a circle large enough for your pie pan, fold it into quarters and gently transfer it to the pan, unfolding it and smoothing it to fit. Trim the edges, if necessary, so you have only an extra half inch all around. Now tuck the overhanging crust under. I made a different fancy edge for this pie. To make one like it, take a fork with long thin tines and work your way around the edge of the pie, pressing the tines into the dough. If you want to speed things up, you can use a prepared crust. I’ve discovered that the frozen crusts that come in their own little aluminum pie pans work very well. They are surprisingly flaky, and the only giveaway that they are not home-made is that the decorative edge is a bit too regular. I’ve also tried the prepared crusts that are sold in the refrigerator case, already shaped to go into your own pie pan and then curled up into long rolls that you unroll. Those are not so good. 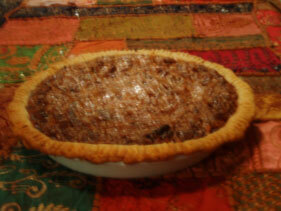 I made an earlier version of this pie with one and the crust was very tough, not flaky at all. For the chocolate chips, I used Ghirardelli bittersweet chips: 60% cacao, according to the package. They worked really well. Bring corn syrup and sugar to a boil in a small saucepan and cook, stirring, just until the sugar dissolves. You will know when this has happened because the mixture will become clear. In a medium-sized bowl, beat the eggs. Add the syrup mixture slowly, still beating. Add the butter, vanilla, and rum, and beat a few more seconds. Now mix in the pecans and chocolate chips using a big spoon. Pour the filling into the pie shell and bake at 350 degrees for 50 to 60 minutes. The crust around the edge should look done but not too brown. Serve it with unsweetened whipped cream. My husband and I had our first slices while the pie was still warm and the chocolate chips were melted. It was delicious that way, but when the pie is cool it’s good too—almost better, because the chocolate chips congeal again, and encountering them is like coming upon bits of candy in the softer texture of the corn syrup-based filling.